Although it may seem that winter is not the best time of the year for a road trip, if you are a sensible driver and pay special attention to the weather, there are areas in Spain that are worth visiting during the coldest months, and their complex and steep ground makes them very suitable to be discovered by car. One of them is the Aragon Pyrenees, an area of beautiful forests and green meadows, lakes, countless streams and rivers, high peaks and large granite masses. Undoubtedly, this rugged environment is considered the mecca of high mountain experiences in Spain. The vast Pyrenees comprise many quaint small towns full of charm and surprises. However, if this is your first time in the area, we recommend you to start your trip in Jaca. This town welcomes winter sports lovers every year and serves as a base camp and gateway to the nearby ski resorts of Astun and Candanchu. Jaca is a living museum – a city with over two thousand years of history that preserves a valuable architectural heritage. The streets of Jaca have a special flavor. The extraordinary historic center was declared a Site of Cultural Interest and it showcases all its stylistic and architectural periods that confirm the importance of the city over the centuries. Its fort or ciudadela, the city’s highlight, has a pentagonal base with moats and a drawbridge, along with the first Romanesque cathedral of Spain, dating from the eleventh century. In front of this church you will find a square with arcades where you can taste some of the sweet delights of the city, such as lazos or condes. After wandering through the streets, enjoy the profile of Mount Oroel, one of the most photographed sights in the area. Drive northwest to find one of the jewels of the region, the Ordesa and Monte Perdido National Park. Before getting there, enjoy driving through the Canyon of Añisclo and make a short stop in Ainsa, a magnificent example of a medieval village. It was declared a Historic-Artistic Site and, in the old town, it showcases a uniform set of typical ancient houses. The slender tower of the collegiate church and the huge castle grounds are almost as big as the rest of the village. Moreover, the city walls are almost entirely preserved. Don’t miss this quaint town full of monuments that will take you to the heart of the Middle Ages! 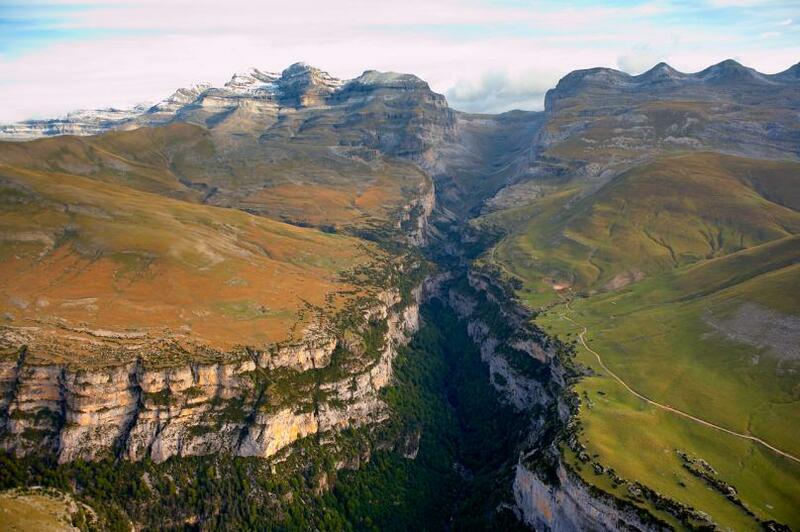 Head to the Natural Park, established as such in 1918, in the Valley of Ordesa. Besides Ordesa, the three valleys that form the Monte Perdido Mountains (Pineta Valley, Escuain Gorges and Añisclo Valley) were added to the park area in 1982. They currently cover an area of 15,608 hectares. 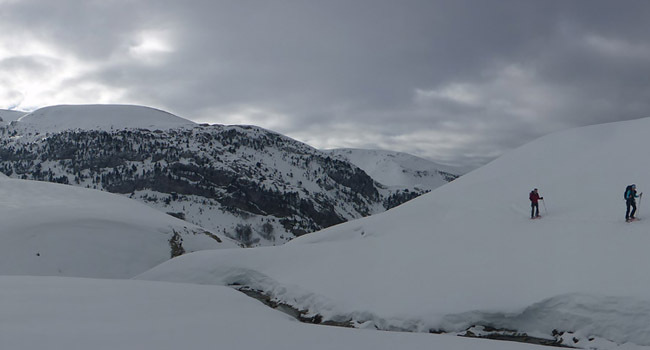 Each one of the four valleys is very different and has its own features and peculiarities. The highest peak (3348 meters) is located in the Massif of Monte Perdido. This is a landscape of contrasts: the extreme aridity of the highest areas, where rain and thaw water filters through cracks and drains, contrasts with the green valleys covered with forests and meadows, where water flows through its canyons and ravines forming beautiful cascades. It is feasible to visit the most beautiful villages on the west part of Ordesa in just one day and have enough time to rest and wander through their streets. The gateway to the valley is Torla, a village nestled between mountains on the right bank of the river Ara. Hike from here to see the Cola de Caballo waterfall. As many other villages in the area, it is full of cobbled streets and stone houses, and it showcases a sixteenth century church, which is visited by a large number of tourists every year. Drive a few kilometers to enjoy the tranquility of Oto, a small town endowed with a defensive tower of the sixteenth century, a beautifully preserved example of traditional architecture. Buesa, located in the upper valley, is a peaceful town with a spectacular viewpoint. From Jaca, take the road that leads to France in order to visit the unmissable town of Canfranc. 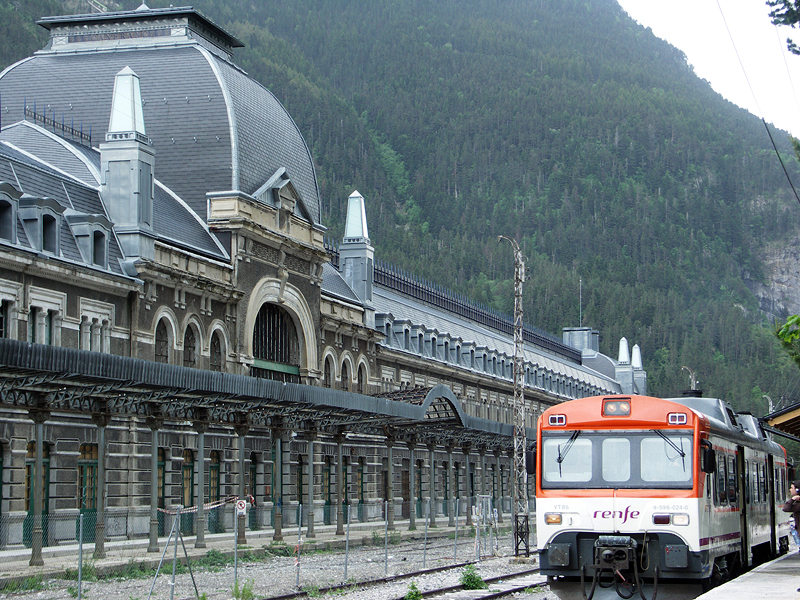 The Canfranc International Station is a splendid building, which was conceived as a great Spanish showcase for foreign tourists visiting the country at the time. It was created within the construction project of a border crossing through the Pyrenees in order to communicate Spain and France using the railway lines linking Tardienta with Huesca, and Huesca with Jaca. Its main building harmonizes typical industrial materials of the time, such as glass, cement, and iron, with large windows, pillars of classical flavor and ornate woodwork. Its curved slate roof has four slopes and is crowned with four pyramidal pinnacles arranged in their flanks. The two building floors are linked to the platform area through open arches. On these two galleries, you can see another set of slate openings, which shows the clear influence of French architecture. And best of all, you can visit them! The station houses a true railway museum. Before finishing your road trip, don’t forget to visit Hecho and Anso, two quaint small villages in the area with typical houses made out of stone and slate roofs, as well as the San Juan de la Peña monastery, 24 km from Jaca. The construction of this monastery, covered by the huge rock that lends it its name, began in the tenth century and houses a pre-Romanesque church. 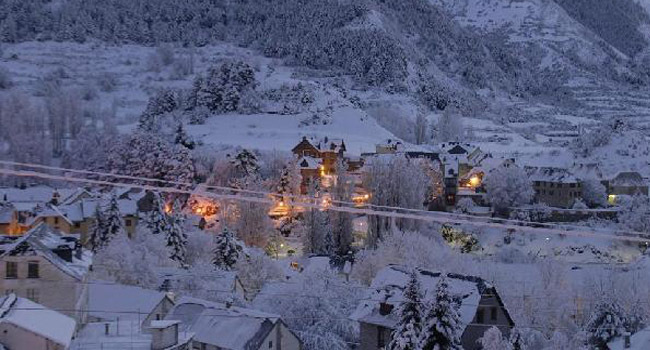 There are areas in Spain that are worth visiting during the Winter holiday & specially by car. Come with us on a roadtrip through the Aragon Pyrenees. We have the last winners of Goldcar´s Advent Calendar! !